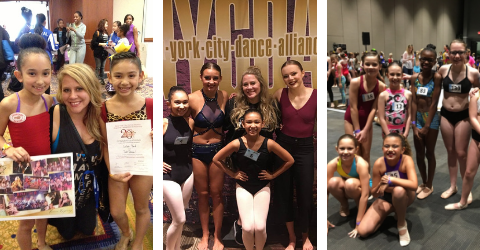 Just Dancers have been attending New York City Dance Alliance (NYCDA) regionals for more than a decade in many cities throughout the U.S. Earlier this year, several Just Dancers attended Pittsburgh regionals and many are planning to attend the NYCDA National Finale in New York City. In the past, dancers have traveled to Chicago and Los Angeles. All Just Dance! competition companies will be competing and taking classes at NYCDA Greenville, N.C. regionals. This event does not have a livestream. On Friday, April 5, all Just Dance! soloists will compete as well as our mini groups. On Saturday, junior and teen groups will compete. Dancers will take classes most of the day Saturday and Sunday. View the schedule here.